Hey Girls, Today i am going to share something about contouring your face and make it look thinner. Hope you will like it. Contouring your face is a simple beauty secret that allows you to slim down your face and make it picture perfect. There are only three make-up tools needed to pull off the perfect contour technique: a blush, bronzer and highlighter. Bronzer is a great way to help contour the face since it should always be a shade or two deeper than your natural skin tone. There are many beauty stores where bronzer can easily be purchased from. Bronzer should be applied parallel to the jaw line to make sure that your cheekbones pop beyond the fleshy parts of your face. Bronzer should also be placed from the bridge of the nose straight down. This technique is used to make your nose look longer as well as thinner. It's important to blend the make-up at this stage to make sure your skin looks as natural as possible. At the end, apply a thin amount of bronze make-up on the jaw line and chin to elongate your face to give it a more model-like affect! Blush should be applied carefully above the bronzer on the apple of your cheeks. Like the bronzer, the blush should be applied parallel to your jaw lines. Lighter colors are essentially better for making the apple of your cheeks stand out but, a darker blush can be used if it truly does not match your skin tone. A cream stick is great for applying the exact amount of blush needed to the angle of your cheeks. A highlighter is a classic secret that celebrities use to add the finishing touches to their contour faces. The rules for applying the highlighter to your face include adding some makeup to the bottom and top part of the lips to make them stand out. Cover a small bump on the top of your nose with the highlighter and run the highlighter over the eyebrow bones. 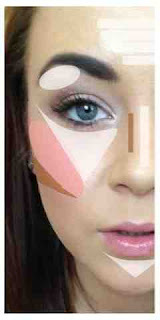 To add misty glows to the entire face add a bit of the highlighter over the blush applied to the apples of your cheeks! It may take some time to perfect the blend of blush, highlighter and bronzer to the shape of your face, but once you do you'll never go back to applying makeup the same way again.